"UNCLE BEN'S® Ready Rice® serves as the base for an extremely versatile salad perfectly suited to accompany any meal! The Original Rice can become the Ready Basmati Rice or Whole Grain Brown Rice, dried cranberries can become golden raisins, pecans can become pistachios or walnuts, celery can become water chestnuts or apples! Use your imagination!" Microwave rice according to package instructions; refrigerate until chilled, about 30 minutes. Place rice in serving bowl. Add celery, dried cranberries, pecans, green onions, and red onions. Stir in mayonnaise. Whisk together white balsamic vinegar, olive oil, Dijon mustard, honey, and garlic. 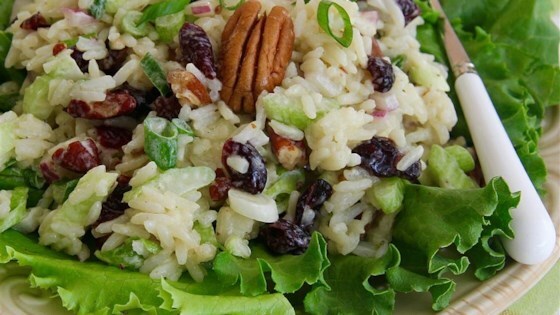 Toss rice salad with vinaigrette. Season with salt and pepper. Refrigerate for at least an hour to allow flavors to blend. If you can't find blood orange white balsamic vinegar, substitute another fruity-type vinegar. Just before serving I add a few dashes of the flavored balsamic vinegar or extra vinaigrette for an extra punch.